One of the best things about being a wedding photographer is that I'm exposed to so many interesting traditions including traditional Korean tea ceremonies like the one you see here. 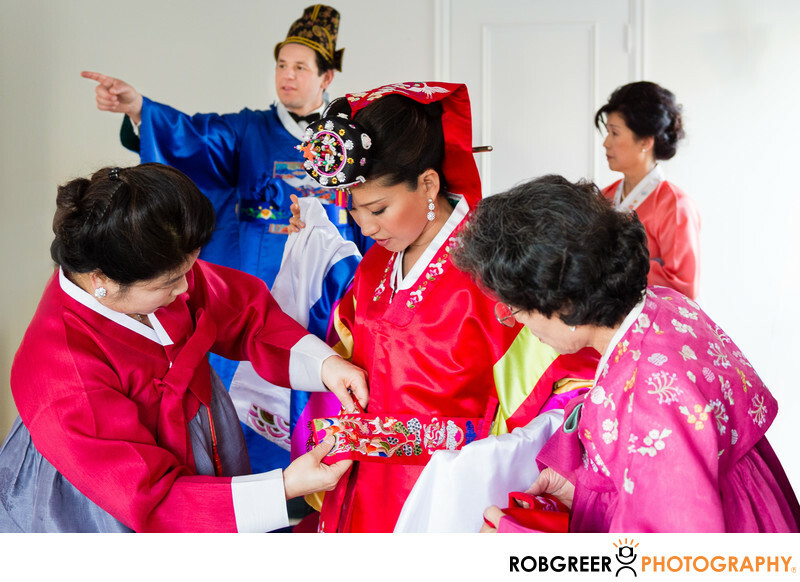 This photograph features a Korean bride and an American Groom as they prepare and are dressed for the traditional Korean wedding ceremony that followed their western wedding ceremony at Ambassador Mansions and Gardens in Pasadena. Although the groom was obviously Caucasian, he was a great sport and donned traditional Korean garb for the ceremony. As an interesting side note, one part of the Korean tea ceremony involves the groom circling the ceremony area carrying the bride's mother, the groom's mother, and the bride piggy-back style. That was the one part of the event that he didn't want to do as he felt it was somewhat silly. When he hesitated, I whispered in his ear that he should really do it because it would be awesome. And it was. And I have the photographs to prove it. In this photograph, the bride is being assisted by her mother, her aunt, and a professional Korean dresser who was hired for the vent. The groom in the background is pointing out a window. If you're wondering why he is pointing, it's because when he was standing in the background he didn't look very interesting. And so I asked him to point out the window because it added interest to the scene—even as the scene in the foreground was perfectly candid. Imagine the groom NOT holding out his arm and pointing. Would the photograph have been just as interesting? Ambassador Mansions and Gardens is located in Pasadena, California. Website: http://ambassadorcampus.com/. Contact Person: Sylvia Noland, (310) 292-5393, sylvianoland@aol.com. 1/60; f/2.8; ISO 1250; 32.0 mm.